“Paul Cassel and Richard Fowles of the University of Utah analyzed the dramatic surge in Chicago homicides in 2016. Homicides went from 480 in 2015 to 754 in 2016 — a stunning event. 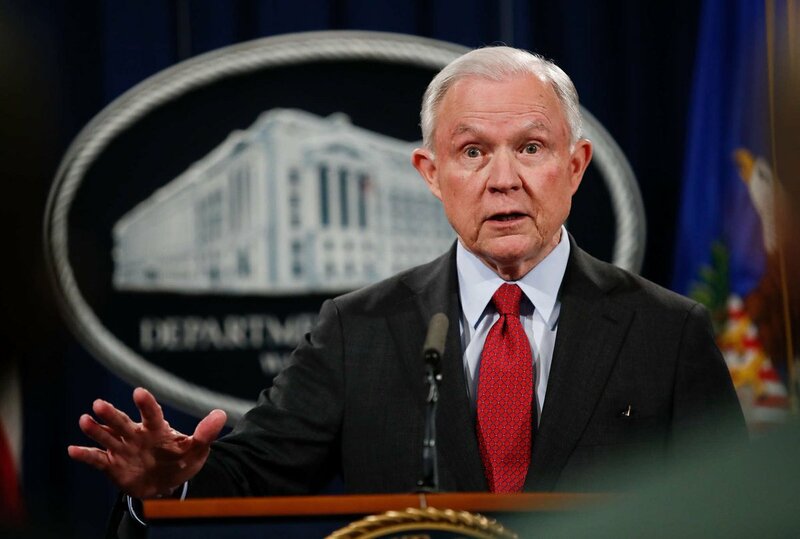 Sessions blamed a legal settlement between the American Civil Liberties Union and the Chicago Police Department for a sharp rise in that city’s homicide rate in 2016, citing an unpublished research paper to support his claim. The ACLU in a 2015 report had found that Chicago police were using stop-and-frisk practices disproportionately on black residents. “Although officers are required to write down the reason for stops, in nearly half of the stops we reviewed, officers either gave an unlawful reason for the stop or failed to provide enough information to justify the stop,” the ACLU report said. Facing the prospect of an ACLU lawsuit, the Chicago Police Department agreed to a settlement that imposed training and data collection requirements in 2015. The study Sessions referenced, by two University of Utah researchers, took note of a nearly 60 percent spike in homicides in Chicago in 2016. The researchers concluded that the ACLU settlement reduced instances of stop and frisk in Chicago, which in turn caused homicides to rise. The attorney general and this study essentially say the ACLU settlement is a mortal threat, and they suggest this is a cautionary tale for the rest of the country. But the study’s methodology has been questioned, other reports about the Chicago homicide spike did not blame the ACLU settlement, and critics point out that other cities that adopted similar or tougher requirements for stop-and-frisk practices did not see comparable increases in homicides. We won’t try to settle the larger debate over stop and frisk. But we will examine how Sessions’s claim holds up. Do homicides go up in cities with stop-and-frisk requirements like Chicago’s? Sessions is quoting from an unpublished research paper titled, “What Caused the 2016 Chicago Homicide Spike? An Empirical Examination of the ‘ACLU Effect’ and the Role of Stop and Frisks in Preventing Gun Violence,” by Paul Cassell, a former federal judge who teaches law at the University of Utah, and Richard Fowles, an economics professor at the same university. Cassell said the study will be published in a forthcoming issue of the Illinois Law Review and has been presented by invitation to the Illinois Academy of Criminology. Zachary Fardon, a former Chicago U.S. attorney, wrote in a letter of resignation in March 2017 that police officers were “scared and demoralized” by the ACLU deal. In 2016, the number of homicides rose to 754 from 480, a staggering rate of increase that was not seen in any other of the 20 largest U.S. cities, according to the Utah study. The homicide total was later revised to 771 for 2016, meaning an increase of 61 percent. In 2017, homicides fell to 650, a 16 percent drop. Sessions correctly quoted from this study in his speech in Tennessee, but that’s not the end of our analysis. Chicago is hardly alone among major U.S. cities that have adopted restrictions or requirements on stop-and-frisk practices. But it is the only one of these cities that registered a big spike in its homicide rate the following year. In New York City, a federal judge found in 2014 that, of the 4.4 million stops police officers had conducted from January 2004 to June 2012, more than 80 percent were of blacks or Hispanics. “More than half of the time the police subjected the person to a frisk,” Judge Shira A. Scheindlin found. She ordered remedies including data-collection requirements. “A lot was done in terms of training, education, community policing; of course, the body camera settlement; reporting on the stops; documenting them; having a basis for them,” Scheindlin, who is now in private practice, told The Fact Checker. The requirements in New York City resemble those in the ACLU settlement in Chicago. But in New York, the murder rate held steady, and crime decreased overall, after Scheindlin’s rulings. Philadelphia has been working under a settlement agreement on stop-and-frisk practices like Chicago’s since 2011, and its homicide rate fell for several years afterward before rising again in 2016 and 2017 (albeit at much lower rates than in Chicago). Seattle has been under a consent decree that includes stop-and-frisk provisions since 2012, and its yearly homicide rate has been mostly steady, hovering between 19 and 27, in the following years. In Newark, N.J., a consent decree imposing requirements for stop-and-frisk practices, among other provisions, was adopted in 2016. The city reported 72 homicides in 2017, a 25 percent drop, although nonfatal shootings increased. “The consent decree was signed and the monitor appointed in the spring and summer of 2016, and Newark continues to have the lowest crime in 50 years since then,” said Paul J. Fishman, the former U.S. attorney for New Jersey, who implemented the consent decree. He said “homicides are down 30 percent” and added that citizen complaints about police have declined by “more than 25 percent.” Fishman said he credited the leadership of the Newark Police Department for recognizing that the consent decree made for effective policing. Cassell and Fowles are not the only ones to have studied Chicago’s surge in homicides in 2016. A study by the University of Chicago Crime Lab did not attribute it to the reduction in stop-and-frisk practices. “Weather cannot explain the surge in homicides and shootings, since monthly temperatures in 2016 were close to their historical averages. City spending on social services and public education did not change much in 2016 compared to previous years, and while the state budget impasse disrupted funding for many community organizations, this did not seem to change sharply in December 2015. Cassell and Fowles called New York City an “anomaly” and wrote that it had a much lower rate of homicides committed with firearms than Chicago, “a small number of guns and gun crimes (relative to Chicago and many other cities),” and a police force that is about 25 percent larger than Chicago’s on a per-capita basis. But what about Newark, Philadelphia, Seattle and the other cities with stop-and-frisk requirements like Chicago’s? The experience in these cities resembles New York’s, not Chicago’s. In their study, Cassell and Fowles cited research by other academics into 17 cities with police departments working under consent decrees, not including Chicago or New York. They wrote that, “on average, violent crime rates were 2.6% higher and property crime rates 6.9% higher” in those cities, as compared with the national average. That’s much lower than the increase in Chicago homicides. So why is Chicago a good example of what could happen in the rest of the country? We asked Cassell and Fowles whether they had identified any other cities where homicides rose, as in Chicago, after comparable stop-and-frisk curbs were adopted. They did not mention any in response. We also asked the Justice Department whether it was aware of any other cities beyond Chicago that proved Sessions’s point about the dangers of the “ACLU effect.” We received no response. Cassell and Fowles’s paper entertains the possibility that other factors contributed to Chicago’s homicide spike in 2016, including “changes in police leadership,” “fractured gang leadership,” “the opioid epidemic” and the release of a video in which a white police officer shoots and kills Laquan McDonald, a black teenager. The video’s release sparked protests and a Justice Department review of the city’s police culture. That DOJ report, produced before Sessions was named attorney general, does not blame the ACLU settlement for the spike in gun violence in 2016. “If limiting stop-and-frisk really did cause an increase in the homicide rate, one would expect it to happen in the jurisdictions that imposed substantive limits on stop-and-frisk, not just in the jurisdiction where data collection alone was taking place,” Takei said, referring to Chicago. Scheindlin, the judge who handled the stop-and-frisk case in New York, said Chicago might be the anomaly. Sessions is cherry-picking an extreme example of rising violence in one city, Chicago, to warn about the dangers of imposing limits or requirements on police’s use of stop and frisk anywhere in the United States. But to prove this theory requires more than one example, harrowing as it may be. Although the attorney general cited the University of Utah study correctly, that study is alone in arguing that the decrease in stop-and-frisk practices was the cause of Chicago’s homicide surge in 2016. Newark, New York City, Philadelphia and Seattle have not seen significant increases in their murder rates since they adopted stop-and-frisk requirements like Chicago’s. Indeed, some of these cities have seen homicides decline even with tougher limits on stop and frisk than Chicago has. 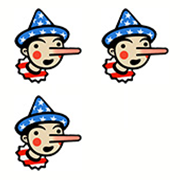 The veneer of an academic study does not change these facts, so we award Three Pinocchios to Sessions. “Paul Cassel and Richard Fowles of the University of Utah analyzed the dramatic surge in Chicago homicides in 2016. … They concluded the 58 percent increase was caused by the abrupt decline in ‘stop and frisks’ in 2015. There had been a horrific police shooting, protests and an ACLU lawsuit. The settlement of that lawsuit resulted in a decline in stops from 40,000 per month to 10,000 per month. Arrests fell also. In sum, they conclude that these actions in late 2016, conservatively calculated, resulted in approximately 236 additional victims killed and over 1,100 additional shootings in 2016 alone. The scholars call it the ‘ACLU effect.’"
in a speech in Gatlinburg, Tenn.